Help! What do you think I should do? I have been wanting to buy old Lego ho scale cars and old wooden toys. 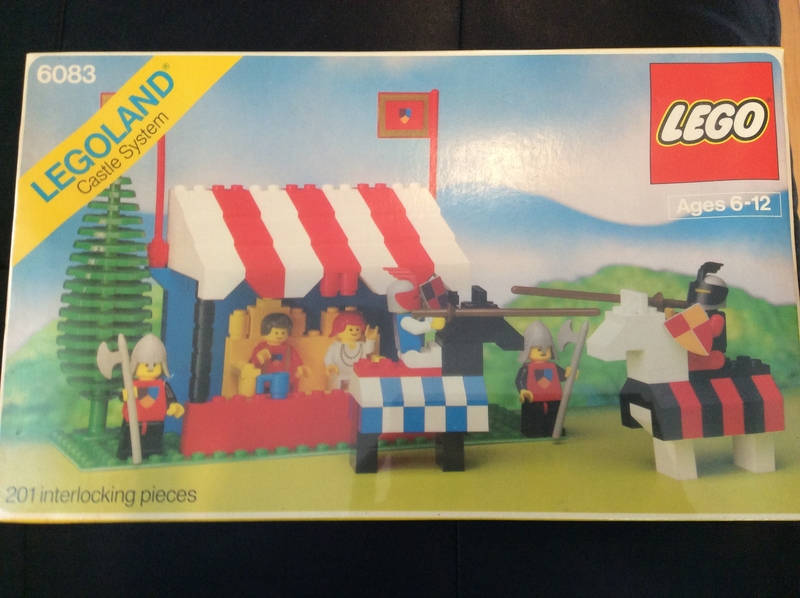 to get money to buy those i was thinking about selling Lego set 6083 knights joust near mint in sealed box. This is my rarest Lego set I have. I have only seen 2 sealed on the Internet. What do you think I should do? Sell it or keep it? Is another obtainable for a reasonable price? If the answer is no to both questions, I personally wouldn't. Rather give it to my future grandson. If you sell it and the money goes to something you want then sell it. Holding on to something just because it's rare and you've had it for years doesn't make it required to keep just so you can say you own one. If it's just on display and you're constantly in fear of scratching it or ruining it's mint condition then sell it to buy something more enjoyable. For me there is no lego set worth keeping just to keep. All sets I have will either be built or sold and never kept just for the sake of it. But it is your opinion on how sentimentally attached you may be. @AllBrick one is not easily attainable. That is why I don't want to sell it. But i really want to start collecting old vintage Lego items. This set goes for more then $750 dollars sometimes. I got mine for $20. Build it first. Then sell it! I agree. I sold childhood Lego and regretted it later, which I know isn't quite the same. Go and look through your garage and sell something else! Or some cute animals, small adorable children, or your spouse! You can't miss something you've never had. All you can do is look forward to a day in the future, near or far, when you might eventually have it. In this case "might" just seems to be a matter of time; it's not something that's likely to become significantly harder - or if looks like it will be, you can reappraise the situation. You can, however, regret selling something which you've already got. I would keep it. Money is still being made, but they are never going to make #6083 again. If you're hoping to kick start a wooden Lego toy collection or non brick plastic toy collection, this isn't going to get you very far. Some of the 50's farm accessories can be had cheaper, but $750 would barely cover the cost of 36 piece block set. Most of the common HO cars can be had for reasonable prices. The VW Beetles are the most expensive of the common vehicles. Before you buy any early Lego toys be sure do research on the item. I made some mistakes early on of over paying for incomplete items, items in poor condition or thinking that it was rarer than it was. If you can make a good profit from it, and you can use the money on something worthwhile, you may as well sell. Keeping it purely as an investment is pointless if you're going to wait for some mythical best time to sell. Barring a bubble bursting, old things will always increase in value over time as they become rarer. So at any future point in time this set will always be worth something, will always potentially be worth more, and will always be otherwise useless to you except as an investment. Just like there's never a best time to buy a computer or smartphone, because newer better ones are coming out all the time, there's never a best time to sell an investment, because it can always go up in value. So if you're ever going to sell it, now is as good a time as any. Don't let Harrison Ford touch it. Sell it. It's just a small box filled with plastic! Or: would you BUY it for $750 or whatever you get from selling it? If not then clearly you value the money more than the set. Put it another way - realistically what's the most you would pay for that set? If you can find someone who would pay (much) more then you should sell. If not, keep. It's as simple as that, if you rule out sentimentality. sell, unless you have money to burn like a mad man. So I have decided to keep it and I will try and find other ways to get ho scale cars and wooden toys. Thank you all for the responses!